but if you prefer freedom and independence, we offer new, dependable, 4-door automatics with air conditioning for your convenience. Our competitive rates include rental, taxes, insurance* and mileage. *Insurance deductibles are the responsibility of the renter in case of an accident or theft. Renters must be minimum 25 years of age, carry a current driver’s license and valid credit card. Payment is made in cash only, but will need a credit card for security. Contact us for pricing and availability. Payment can be made in cash (pesos, U.S., Canadian). 2. What type of driver’s license do you require? We can accept driver’s licenses from Canada, U.S., Mexico, Europe or an International driver’s license. 3. Do you provide airport drop-off and delivery? We can only provide delivery of vehicle locally (Chapala & Ajijic). 4. Can I use airline miles to pay for my car rental? S&S Auto can not accept airline miles or credit card’s points to pay for the car rental. 5. Can S&S Auto guarantee a particular car? No, although you can request a specific model, but S&S Auto can not guarantee any vehicle. 6. What do I do in case of an accident? S&S Auto will provide you with emergency numbers to call 24 hours per day, 7 days per week. 7. Are your rates guaranteed? Yes, we guarantee our rates in U.S. dollars. 8. Can I rent a car without a credit card? Normally a credit card is required to secure a rental, but if you don’t have a credit card we will accept a cash deposit of 10% of the value of the vehicle at time of pickup. 9. I’m not comfortable sending my credit card number over the internet, what can I do to confirm the reservation? You can call at (376) 765-4800 (add prefix of 011-52 if dialing from the U.S. or Canada). 10. In case of cancellation, will there be any fee? We require minimum 24 hours notification of cancellation, or you will be charged for one day auto rental. 11. Can I use my credit card for insurance coverage? Our rates include full-coverage auto insurance with a 5% & 10% deductible, this can not be waived. 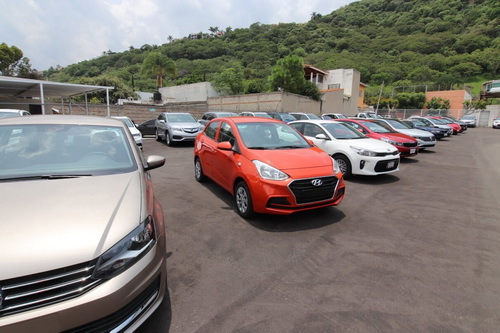 We are conveniently located on the highway (Carretera Ajijic-Chapala) between Ajijic and Chapala, Av. Hidalgo 421.